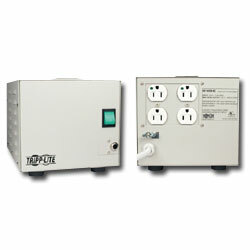 IS 500 Hospital-grade Isolation Transformer. Offers line isolation, continuous noise filtering and enhanced common mode surge suppression. Full UL2601-1 medical grade listing with hospital-grade plug and outlet receptacles makes Isolator Hospital Grade transformers ideal for the protection of sensitive electronic equipment in patient-care areas. Reduces the cumulative leakage current of the Isolator and connected equipment to levels below 300 microamps. Includes 4 widely spaced NEMA5-15R hospital grade output receptacles, a 6-ft power cord, hospital grade input plug, circuit breaker overload protection and lighted power switch.